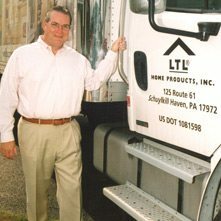 History - LTL Home Products, Inc. Established in 1989, LTL is proud to manufacture and market many well-established products. Our headquarters’ setting – nestled in a mountainous region of Pennsylvania – inspires a loyal and dedicated staff to invent innovative products for demanding markets. Spectrum Accordian Folding Doors are a distinctive line of refinished stock and special order interior doors. Pinecroft Exterior Shutters, Cafe Doors, Decorative Dividers, Passage Doors, and Decorative Wood and Glass Bi-Fold Doors are a quality wood products offering solid wood, solid quality and solid value. GroundTech products are a smart solution to the traditional task of digging post holes for mailboxes and fence posts. Wallscapes Shelving is an innovative and unique concept that offers interior fashion for your walls. Select from glass, wood, metal and a kid’s collection. Since our founding, LTL has grown at an astounding rate. Inc. Magazine named us one of the 500 fastest-growing private companies in 1994. We are pleased to include among our clients some of the nation’s major retailers, including Home Depot and Lowes. Complementing our Pennsylvania location are LTL facilities in California, North Carolina, Texas, Canada, Taiwan, and Germany.